Searching homes for sale in Guaynabo, PR has never been more convenient. With Point2 Homes, you can easily browse through Guaynabo, PR single family homes for sale, townhouses, condos and commercial properties, and quickly get a general perspective on the real estate prices. You can also filter listings based on price drops in the past six months, so you’ll never miss a bargain. Get instant access to a lot of relevant information about Guaynabo, PR real estate, including property descriptions, photos, maps and Guaynabo demographics. You can also use the map view to find homes and apartments for sale based on amenities in Guaynabo, PR that you may want close by. There’s information on the Guaynabo, PR real estate market at the bottom of search results pages, if you’re looking for an overview of the area. If you’d like to work with a professional, contacting real estate agents in Guaynabo, PR is very easy. All you have to do is check the details for your favorite real estate listing, and use the form there. Or, if you’d like more options, click on the Tools tab and Find an Agent. 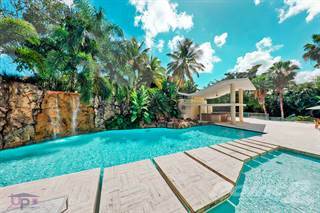 There are 189 homes and apartments for sale in Guaynabo, PR. Easily arrange and sort through all of them based on price, property type, square footage, lot size or building age. You can also use any specific keywords you may want to narrow down your search to only the most relevant properties. Stay up to date with real estate opportunities in Guaynabo, PR, by simply saving your search; you’ll receive daily or weekly emails (your choice) from Point2 Homes, with new listings which fit your criteria, while they’re fresh on the market. Located in the northern part of Puerto Rico just west of the capital city, Guaynabo is considered part of the San Juan Metropolitan Area. There are approximately 98,000 people living within the 27 square miles of the city and over 2.5 million in the metropolitan area. While there are many options for tourists to explore Guaynabo, the city is also home to many businesses such as Microsoft, Chrysler, Toshiba and Iberia Airlines. Guaynabo is also a host city to four consulates: El Salvador, Finland, Nicaragua and the Netherlands. There is also one university in Guaynabo – Atlantic University College which was established in 1983 and has the distinction of winning an Emmy Award for Technical Achievement. Guaynabo has many similarities to suburbs found in the United States. This city is known for good roads and infrastructure. When the Spanish first settled Puerto Rico, there were Taino indigenous people living on the island. There are many words and phrases in use throughout the city and the country with Taino influences. In fact, the word Guaynabo derives from Taino. The Guaynabo region was settled by Ponce de Leon back in 1508. Although abandoned in 1521, the Caparra ruins are now a United States National Landmark. You’ll find the La Marquesa Forest Park, a number of locally famous food trucks, as well as Fort Buchanan which dates back nearly 100 years. Guaynabo is in a tropical monsoon climate located right on the coast of the Atlantic Ocean. On average, high temperatures soar in the 90s throughout the months of June through October. The coldest months are in December and January when the lows dip into the mid-60s. The wettest months are May and September where rainfall totals average around 9 inches per month. These two months provide nearly one-third of the annual rainfall in Guaynabo. On average, the city receives 51 inches of annual precipitation. Real estate and rentals are quite affordable in Guaynabo. As part of the San Juan Metropolitan Area, Guaynabo enjoys the benefits of being near the capital city while still maintaining an independent feel. There are homes, condos and apartments available to suit all budgets and preferences. Guaynabo offers a modern infrastructure and businesses to accommodate the lifestyle of its citizens. There are plenty of restaurants and shops like Starbucks and Olive Garden as well as Walgreens. Guaynabo hosts many festivals throughout the year attracting thousands from all over the region. Nickname(s): "Ciudad de los Conquistadores"
There are a few major museums located in Guaynabo. The Museum of the Conquest and Colonization of Puerto Rico is the location of the Caparra Archaeological Site. Here, one can explore the remains of the first Spanish capital of the territory dating back to the early 1500s. It is considered the oldest settlement within the United States territories. Another museum is the Museum of Transportation of Puerto Rico. This museum exhibits the various modes of transportation used throughout the history of Puerto Rico from canoes to subways. 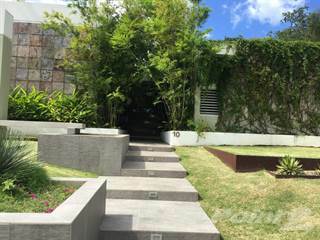 There are also a handful of art galleries within Guaynabo. Guaynabo hosts several festivals and events annually. Mabo Carnival is a major event taking place every March. Other unique and fun festivals include Three Reyes Festival, Salsa National Day, Bomba & Plena Festival and two Christmas-themed events. The most prominent sport in Guaynabo is basketball. Home to the championship Guaynabo Conquistadores, the venue in which they play – the Mario Morales Coliseum – was named after a basketball legend. The Arena holds 5,500 fans and is a popular place for concerts, roller derby and volleyball. The Parque José “Pepito” Bonano is another sports venue used mostly for soccer and baseball. Guaynabo has an active and fun nightlife featuring a diverse selection of bars. Some of the most popular bars and nightclubs in Guaynabo are the Lemon Drop Bar & Lounge, Shannan’s Pub, Code Bar & Lounge and Club Kronos. There are 10 barrios, or neighborhoods, in Guaynabo. Pueblo de Guaynabo encompasses the downtown portion of Guaynabo as well as the administrative center of the city. Other barrios include Camarones, Frailes, Guaraguao, Hato Nuevo and Pueblo Viejo. Along with these barrios, Guaynabo is surrounded by three major cities: San Juan, Bayamon and Aguas Bueanas. San Juan is the capital of Puerto Rico and is the largest city in the territory. It is located just to the east of Guaynabo. Both Guaybano and San Juan share the shores of San Juan Bay. The history of San Juan and the surrounding area is one of the oldest settlements in the western hemisphere having been established in 1509. Bayamon is historically known as the location where the Taino, the indigenous people of Puerto Rico, first encountered the Spanish settlers. Bayamon is situated just west of Guaynabo and famously has 5 rivers flowing through the community. Bayamon is also famous for having the most shopping malls of any city in Puerto Rico. Known as the “City of Clear Good Waters,” Aguas Buenas is located just south of Guaynabo in the Cayey Mountains. The economy is driven mostly by its coffee plantations and it is also home to a major egg producer. Approximately two-thirds of the residents in Caguas are homeowners with around 38% being renters. Two-thirds of the homes in Caguas average between $100,000 and $200,000 . Housing options are very affordable compared to other major cities in Puerto Rico including the capital – San Juan. Compared to San Juan, rent and real estate is approximately 37% less in Caguas. When compared to a closer, more inland city like Bayamon, Caguas is still less expensive by nearly 21%. Homes in Caguas vary in size and location and there are plentiful options to accommodate a variety of budgets and needs. For those interested in living closer to downtown there are options for condos and villas, whereas houses are more prominent in the outlying areas closer to the mountains. 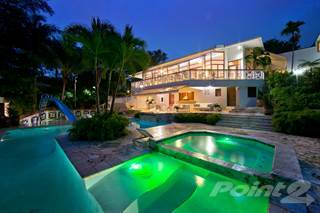 As a territory of the United States, there are no strict laws regarding home sales like there are in other Caribbean countries such as Mexico. The Atlantic University College is the oldest higher education institution in Guaynabo. This school is dedicated to the digital arts and has won two Emmy’s and been nominated for three others. Puerto Rico’s Department of Education, located in nearby San Juan, manages the public schools in Guaynabo. There are a few private schools as well including the Colegio Marista de Guaynabo – a Roman Catholic school founded in the 1960’s. Two former Puerto Rican governors attended this school. Public school throughout Puerto Rico is taught in Spanish. Grade levels and benchmarks are similar to those in the United States. School, from preschool to high school, is compulsory to age 17.